Many readers have asked for a review of the Scythe Infinity and we recently received the latest version of the famous Infinity heatpipe tower. The Infinity certainly qualifies as something of a legend, but legends have not always performed as expected in our cooling tests at AnandTech. Does the Infinity live up to the performance goalpost set by the Tuniq Tower 120, or like all the others tested so far, does it fall somewhat short? Our goal is to find an answer to this question. 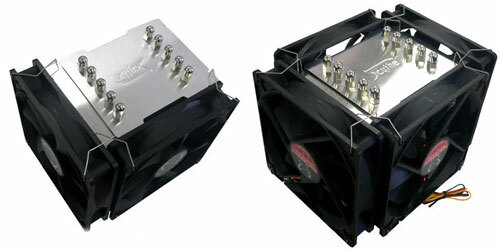 Some early versions of the Infinity were praised for their cooling ability, but criticized for high noise by enthusiasts who value noise reduction above all else. This most recent version of the Infinity proclaims that it includes a "silent" 120mm fan. In our benchmarking, we will definitely examine the low-noise fan claim, but there is always the concern that a lower-noise fan may not cool as well as the highest CFM - and higher noise - fans. The Scythe fan is 120mm, which is large enough both to move a lot of air, and to do so at slow enough RPM to keep noise low. Another addition to the newest Infinity is support for the AMD Socket AM2. Many kits like the Infinity, which were introduced before the launch of AM2, have not been updated to support the revised AM2 socket. Fortunately the Scythe Infinity is now one of the top-of-the-line coolers that fully supports AM2 - good news for AMD enthusiasts. We have talked about universal mounting systems in the past, but Scythe comes through where many others have fallen short on that claim. Scythe includes adapters for any CPU you can currently buy. Another feature of the Infinity is the ability to mount a 120mm fan on any of the 4 sides of the cooler. Some enthusiasts have found new ways to use this feature, by running two fan cross feed, two fan push-pull or even four fan configurations with dual push-pull. Frankly the Infinity is very large and heavy to start with and an Infinity with four fans would be daunting in both size and weight - and it actually would not fit in our case. However, the potential of a push-pull cooling arrangement intrigued us. Scythe USA was also kind enough to send the latest Ninja Revision B, and the new revision of Ninja will be highlighted in an upcoming review. That gave us the advantage of a second Scythe cooler with the same silent fan. With two fans in hand we couldn't resist testing a dual-fan push-pull configuration, which would fit in the mid-tower case. The main interest was whether the two fans - one pushing air and one pulling air - would make any difference at all in the cooling abilities of the Infinity. The results are very interesting. With this review of the Scythe Infinity, we are on the downslope of our tests of current high-end air coolers (Ed: with 50 plus inches of February snow where I live I couldn't resist the skiing metaphor). We have the Thermalright Ultra 120 in for review, and we will also be testing the Scythe Ninja Rev. B. Noctua, an Austrian manufacturer of cooling solutions, has also sent us the Noctua NH-U12F which will be reviewed in the near future. We will also take a closer look at the OCZ Vindicator, which is the recently introduced heatpipe tower from OCZ. Once these reviews are complete, plus any late additions to the air cooling Olympics, it will be time to select the best air cooler available. I love how Anandtech started testing and reviewing other PC components. I find it somewhat to be understood - as the air would flow worse inside the cooler, part of it will flow out of it using the lateral spaces - as such, contributing very little or not at all to cooling. What I want to see is a more head to head test, with either the Tuniq using fans at the Infinity noise level, or the Infinity getting two higher powered fans, to see which wins. What I am interested in is the best performing silent/near silent fan & heatsink combo. We appreciate your suggestion, but we make every effort to test CPU coolers as they are packaged if at all possible. It would be a massive effort to try to go through an assortment of fans, find those singles and pairs that noise match and then replace fans supplied with the coolers with these matched singles and pairs. HSFs like Zalman have embedded fans which can't be swapped, and many top coolers use fan sizes with more limited selections than the 92mm or 120mm fan sizes. What is the ambient temperature in the room during testing?